Note: I guess you could call this part two of this post, "Goodbye pitchpipe! Hello $13 Digital Tuner!" Huzzah! 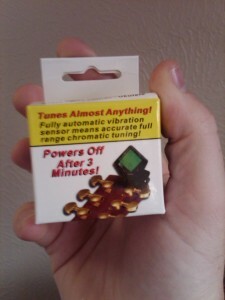 I got my $13 digital tuner in the mail today. And, in case you are wondering, I don't have freakishly gigantic hands. This little guy is tiny and precious! Mine actually came with two batteries, for some reason, and I'm not complaining about that one bit. I opened up the box, popped in the battery and we were off and running. I just clipped it to the head of my uke and started tuning away. In seconds, I was in perfect tune. I feel like I have a pretty decent ear, but with a pitch pipe, it definitely takes me a little bit of time to tune my uke. No more! What am I going to do with all this extra time?! I was going to make a video of me tuning my ukulele with this little gadget but a) I didn't know how to hold everything at the same time and b) it literally took 20 seconds. So, I'm definitely glad I put my money where my mouth was this time. This is the best ukulele accessory purchase I've ever made. Yay! Accessories: Uke Thongs! Not just for the ladies! Well, it's not as scintillating as the title would have you believe, but it's pretty close. For those of you who find yourself playing Uke while standing up, or walking around (or, as in my case, running from the police) you have probably perfected the art of holding the ukulele against your body while you play. Well, what if I told you that wasn't neccessary? Yup, here we are, using our hands like suckers when the Uke Thong could be doing all the work. Check it out! Ingenious, I tells ya! Looking at the auction, there are a couple of different color choices. Woah. Black and Hot Pink checkers?! Sweet. Those will match my Vans from Junior High! Posted on October 9, 2009 September 30, 2016 Categories Ukulele AccessoriesTags uke thong, ukulele strapLeave a comment on Accessories: Uke Thongs! Not just for the ladies!